He counted; one, two, jump! On his back, he flew 35 feet into the air, arms outstretched, his shout trailing behind as his long hair whipped about. The air swooshed against his scraggly beard and at the last moment, he turned, diving perfectly into the aquamarine waters below, plunging deep. And with a gasp of air, he reemerged, with a triumphant laugh. 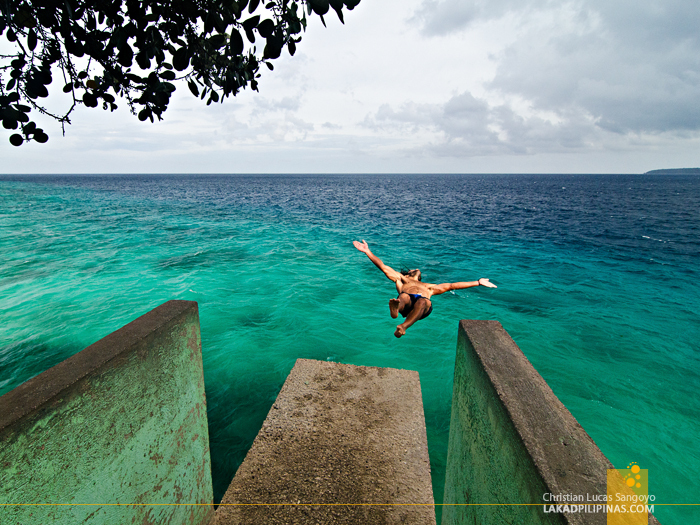 Watching from the concrete platform from the cliff area of Salagdoong Beach, I wished mightily that I could jump too. My mind was sure I can do it, but my body resisted, my hand still painfully swollen after a minor accident at Cambugahay Falls. 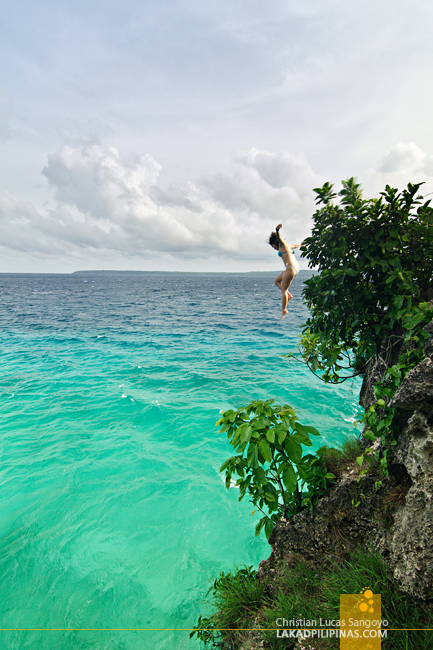 I’ve tried this before at Camotes Island’s Boho Rock Resort, doing a running jump over and over again from a platform, not as high as Salagdoong’s, but high enough for a good adrenaline rush. It is addicting once you’ve conquered your fear and made that all important first jump. 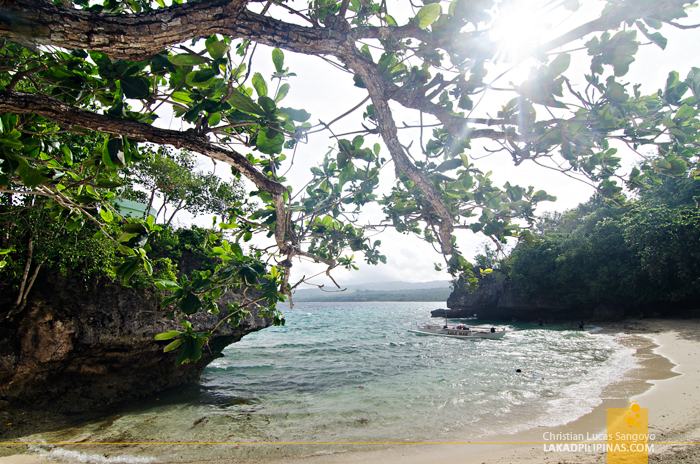 Salagdoong Beach is located at the northeastern side of Siquijor Island. 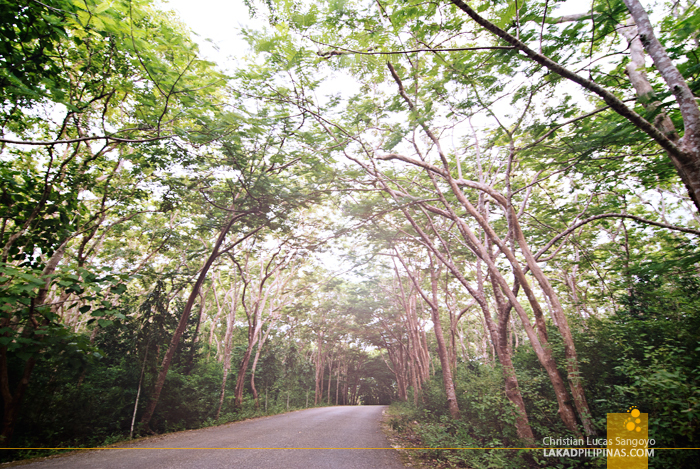 Getting there, we passed a remote part of the town of Maria where the road is lined by tall mahogany trees, resplendent with the lazy afternoon sun. The beach is actually part of a government-run resort, Hotel Agripino, which sits at the top of the hill overlooking the beach. Accommodations here are quite affordable (from PHP800.00) and they actually have a few rooms near the shore which I inspected some years back. My partner-in-crime back then found them to be unsatisfactory though, making us cough up a small fortune to book a few nights at Coco Grove Resort instead. Back then, I wasn’t really able to appreciate how beautiful Salagdoong’s beaches were, arriving just after the sun had set, but now, how I wished we made do with their old musty rooms. 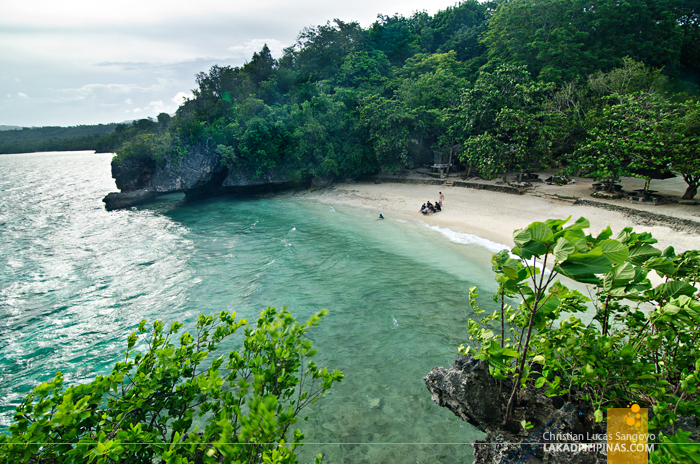 Salagdoong’s twin beach are simply spectacular. 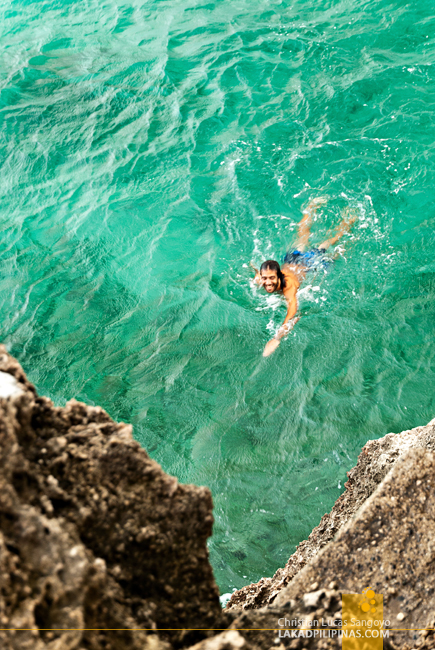 The two beaches are right within reach of each other, separated only by a pile of 50-foot coral rock where the cliff-diving platforms are set. The sand isn’t as fine as those in Tubod Beach nor even the Siquijor Port Beach, but they’re creamy enough. But the real draw here is the water, a deep and clear emerald beauty with a luscious marine life beneath. Granted, we really weren’t able to snorkel this time, but we heard it’s much more beautiful below than above. 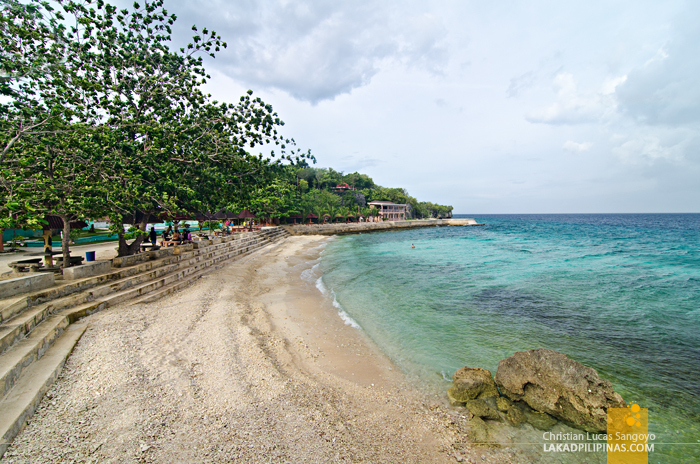 And there is, of course, the cliff-diving area which made Salagdoong Beach famous. The rock actually has two diving platforms, one set at 20 feet high and the other at 35 feet. The water, I presume, is deep enough to handle anyone jumping from those heights. So there we were with my travel mate, waiting for someone to finally take the plunge. After several minutes of ruminating at the edge of the platform, the guy backed down, to the hoots and catcalls of his friend. My buddy quickly replaced him, asked me if I was ready with my camera, and with my nod, she quickly sprinted and hurled down the deep blue sea below. Goodness, I wish I could do that too. Hi Enlil! Yes, indeed you can. Unfortunately I'm really no good in driving motorbikes. 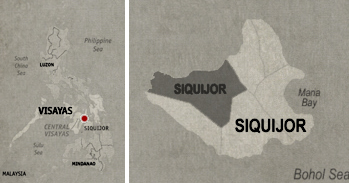 We once planned on biking the whole of Siquijor, but we can't seem to find bike rentals near the port. Hi. How much for the cost of the full day tricycle tour? Do we have to pay for gas or something? You can rent a motorbike around 350-500/day if you have license and knows how to drive. If you don’t have any license but knows how to drive can you still rent a motorbike? Hi, I'm not sure how relaxed or strict motorbike rentals are in Siquijor. I guess you can take a chance. Let me know how it goes.